Compare prices on car hire in Avignon from all the major brands and find the best deals. When you book through us, unlimited mileage and insurance are always included in the price given. Avignon is situated on the left bank of the river Rhone, in the northern part of Provence in southern France – specifically in the department of Vaucluse.The town has approx. 95,000 inhabitants, but one takes the entire metropolitan area, the population is increasing at nearly twice that. Avignon’s ancient history dates back to ancient times, but the city had its heyday in the early part of 1300’s – when the period was the papal western. From that time also stems Avignon’s most famous buildings: the Palais des Papes (Pope’s Palace). 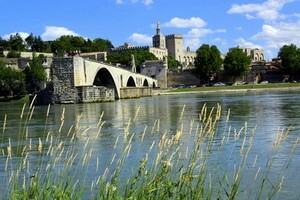 Otherwise, there are a number of historical monuments and other sights in Avignon. Among the most popular is the Pont d’Avignon, medieval fort Ramparts and the Cathedral of Nôtre Dame des Doms (with John 22s Mausoleum). There are also a number of different museums in the city. Among the events that draw people here, must first and foremost Avignon festival mentioned. There is a large, international theater festival that has been held here every summer back to 1947. At its peak, over 100,000 people visited this festival. The nearest airport is Aéroport d’Avignon-Caumont, ca. 8 km. southeast of the city.